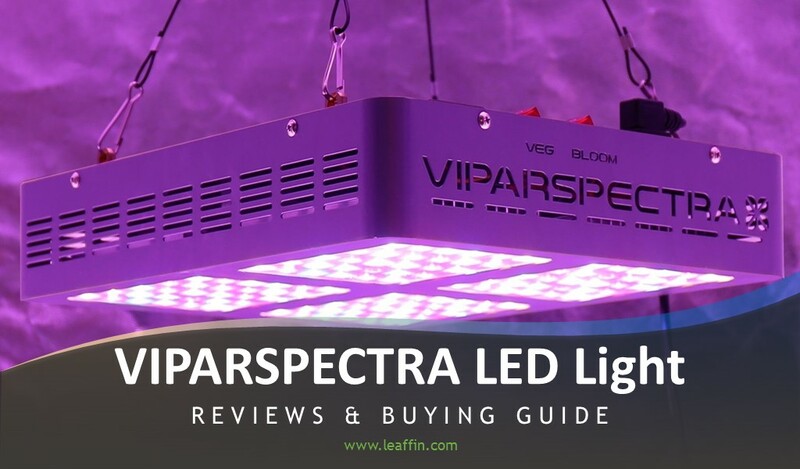 Viparspectra Review 2019: Are these LED Grow Lights Worth buying? 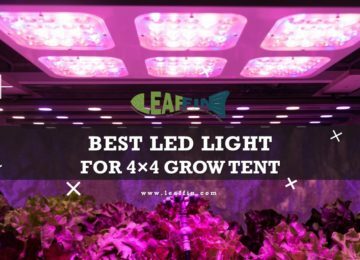 With a growing trend of indoor growing, aquaponics, and hydroponics, you will find a lot of brands selling grow lights in the market. LEDs have outperformed HID and fluorescent lights but high-quality LEDs are fairly more expensive. However, The extra 100-200 bucks pay itself off in the first or second harvest. Since it has lower operational cost and longer lifespan. You really do get what you pay for with LEDs! However, there is a brand that is providing affordable and high-quality LED to you. 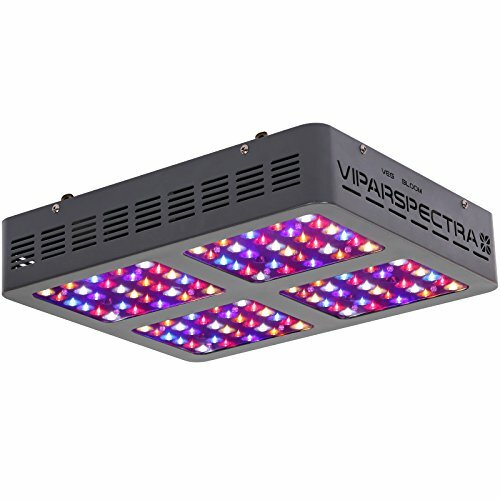 A popular player in the LED grows lights industry is Viparspectra, whose lights are popular for beginner growers. 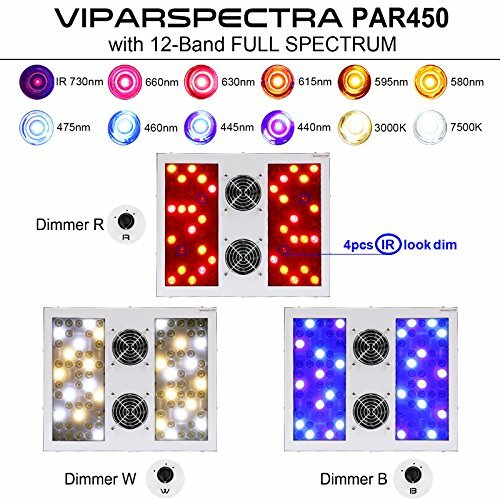 Viparspectra is owned by the Chinese company Shenzhen Bailuo Technology Co., Ltd. They’re based in Guangdong, China and are bringing LED directly to market themselves instead of going through a distributor or middleman. This is one reason why their LEDs are less expensive than comparable models — by going directly to Amazon and other retailers from China, they’re able to avoid markups that distributors and wholesalers typically charge. If you are in a hurry, then simply read below. 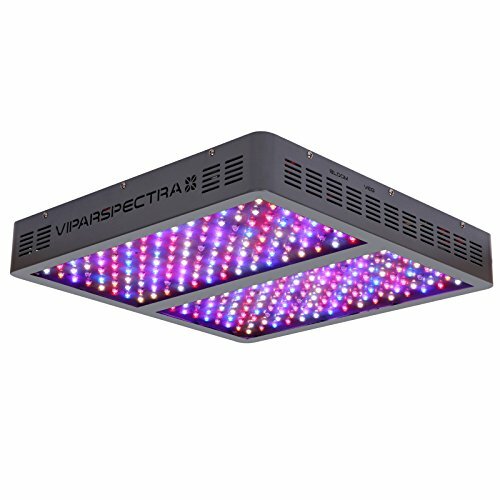 Viparspectra LED grow light is a great choice for beginner and mid-tier growers. They offer LED lights at an affordable price point, partially because the manufacturer themselves are selling these lights instead of going through a wholesaler or distributor. On top of that, they offer a 3-year warranty and a 30-day exchange, money back, or repair policy for any lights that stop working in 30 days, which gives the buyer a protection on purchased product and build trust in their quality. 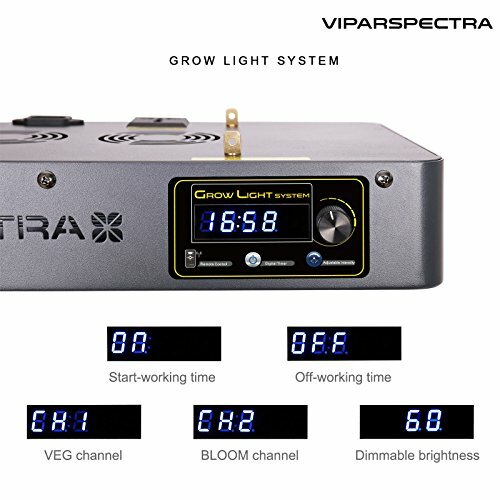 While there are objectively better LED grow lights on the market, Viparspectra themselves state that they aim to be mid-market for hobbyist and intermediate growers, and I think they occupy that space well. 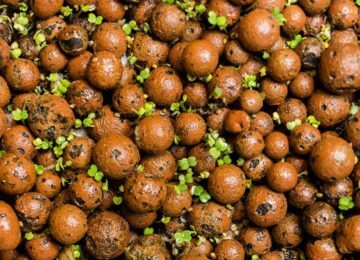 They’re a solid pick if you’re a beginner in indoor growing. 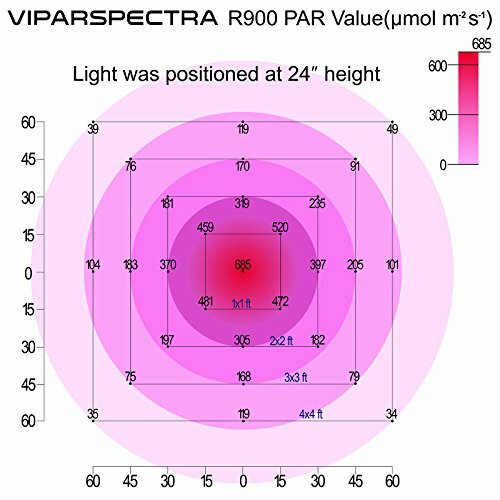 This is a full spectrum LED array and provide light comparable to natural sunlight, which is way too bright to stare at with your naked eyes. It is possible to grow plants through their entire lifecycle without having to switch lights (a problem you run into when growing with only a metal halide or high-pressure sodium lights). 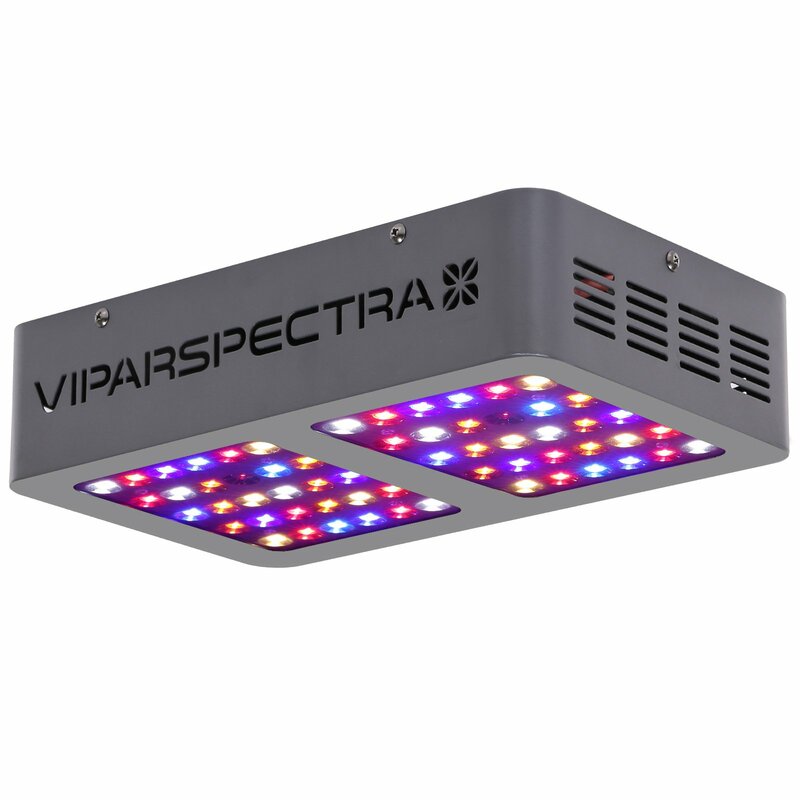 Viparspectra also has the LEDs mounted at a 90-degree angle pointing straight down at your plants. Keep light 24" away from Plants will give you perfect coverage area and maximum exposure. 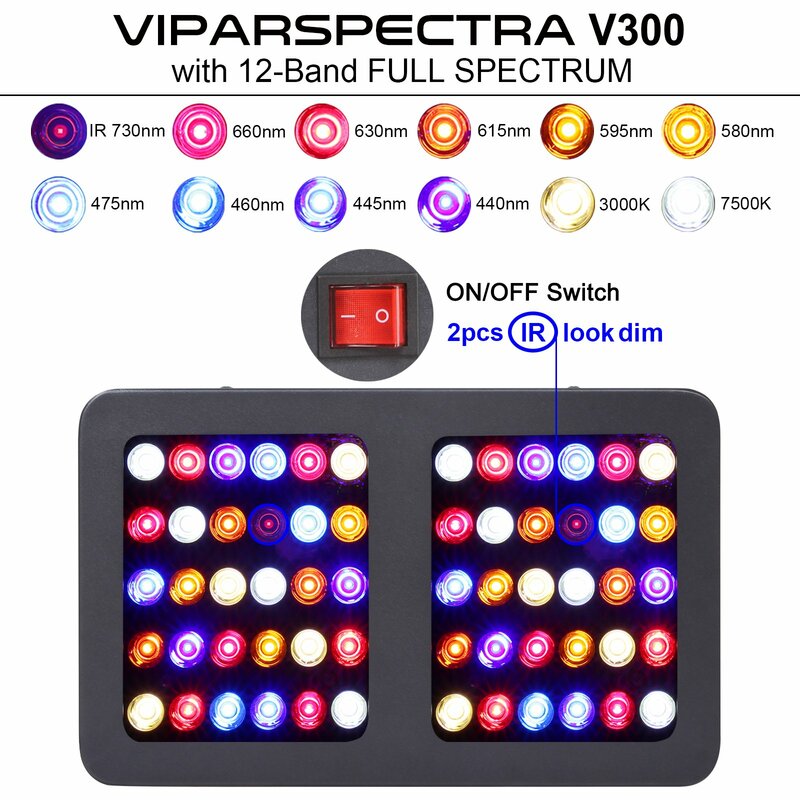 More importantly, all Viparspectra lights come with a Vegetative and Bloom switch, meaning you can turn off a specific spectral range of the lights to manipulate the spectrum that you’re giving your plants. Lumens and PAR are the measures of the light intensity emitted by the LED panel. Lumens is a unit of visible light emitted by a source and are for humans. 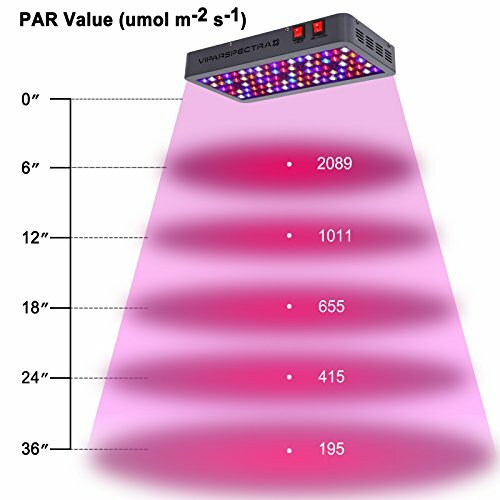 PAR is what we look at when we are growing plants, a measurement of the intensity and coverage of the light. 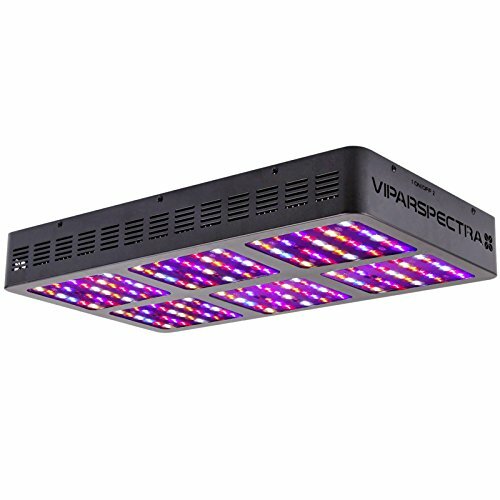 Check below for the PAR values at 18″ for Viparspectra V300 full spectrum LED grow light. 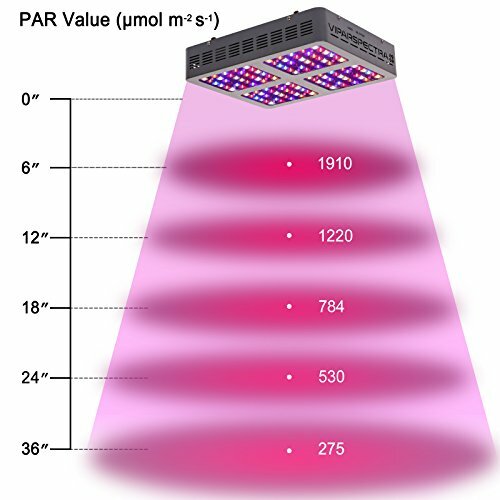 One of the important things, whenever you buy a LED grow light as our guide to buying a LED grow Light suggests. The quality of a light manufacturer’s warranty is a direct signal as to how much they believe in the product quality that they’re making and selling to you. Viparspectra offers three years warranty for all of our products purchased against manufacturing defects, from the date of purchase. However, it does not cover damage due to high moisture levels, water, power surges, improper hanging/mounting, improper use, dust build-up or user modifications. 1. Exchange. We will email you a pre-paid return label, please ship the light back to our USA warranty center. A replacement will be sent to you for free as soon as we receive the defective light. 2. Money back. We will email you a pre-paid return label, please ship the light back to our USA warranty center. You will get your money back as soon as we receive the defective light. 3. Repairing. We can send parts free of charge immediately if you’d like to repair a simple defect. Or we will email you a pre-paid return label to bring light back, then ship back to you after we repair it. All for free. For buyers outside of the USA, if any lights stop working within 30 days, No prepaid return label is provided. Self-cooling Fans & Heat Sink: Conventional lighting heats up quickly and with much higher temperatures, make LEDs a superior choice. The ViparSpectra Reflector Series is equipped with multiple 4.72-inch fans – each one includes its own individual heat sink that properly dissipates heat without issues. Using these LEDs, you likely won’t need additional cooling systems in your grow room, or any fancy exhaust system if you’re simply growing on a small scale. Low Energy Consumption: LED grows lights notoriously use much less energy than their counterpart, HPS. 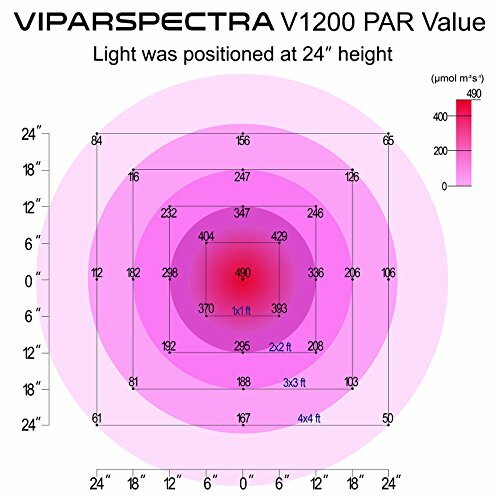 The 300w ViparSpectra panel uses a surprising average of only 136 watts, which when compared to many other traditional kinds of lighting, is nearly half as much as you would expect. Additionally, the light does not require any ballast since you can use a timer to control it. This table gives a comparison between Coverage Area, Dimension, wattage, and weight. Click on the name of the model to check the price of that model. 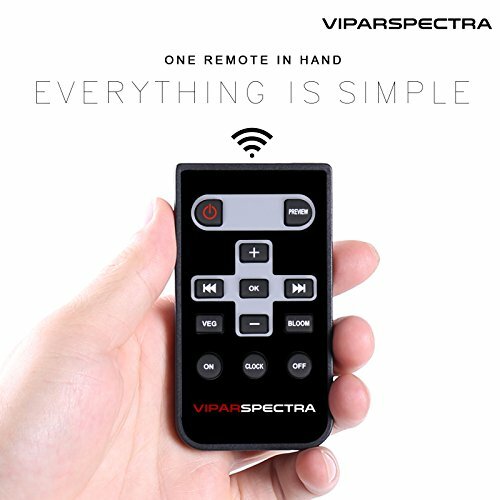 Let's go in deep to know the different series and models available in the product line of Viparspectra. As the name suggests, the Reflector-Series offer built-in reflectors to help direct all of the light down towards your plant canopy instead of scattering it around your grow room or tent. The 450w and the 600w models are the most popular lights in the Reflector-Series. Even professional growers often buy a few 450w or 600w models and run them adjacently instead of opting for the 900w or 1200w model. All models come with Vegetative and Bloom switches, 4.72″ fans and Aluminum cooling heat sinks. How Far to Keep from Plants: 24″ is the recommended starting distance from the plants. How Far to Keep from Plants: 24" is the recommended starting distance from the plants. It has a remote! You can set working/off -time to turn the light on and off automatically. It also has a dimmable feature to program VEG and BLOOM brightness individually. It is available in a lot of models: 300w, 450w, 600w, 1200w and 1350w. This series has the convex lens that distributes light to your plants evenly, (not far too concentrated in the center of the growing area). Viparspectra is obviously better than Mars Hydro. Mars hydro has a warranty of 1 year as compared to 3-year by viperspectra. The labeled lifespan of marshydro is 50,000 hrs while viperspectra has 100,000 hrs. 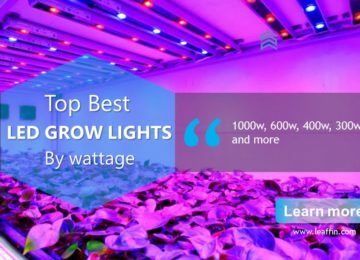 You can check other alternatives of Viperspectra in our post about Best LED Grow Lights and if you're finding a best one by watts, this comparison of led lights by watts is for you. I just ordered 3 450w lights and I was wondering the distance I should keep the light from my plants throughout the growth cycle. e.g. from seedling to veg to flower? 22-36″ is the standard starting distance for the vegetative stage. You can move it to 18″ away in the flowering stage, or possibly even a few inches closer for light-loving strains. 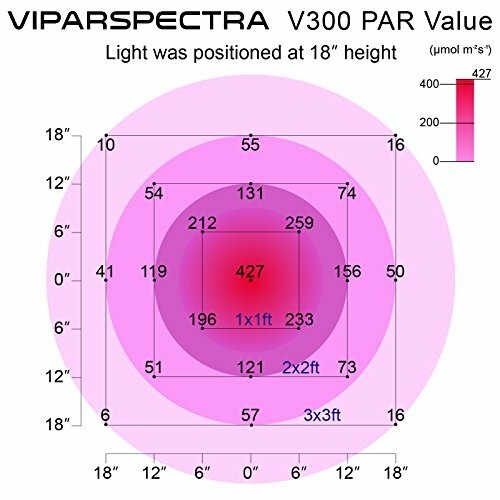 I got the viparspectra 300w light for many good reviews on Amazon. But this light does not work for me. My plants grow well in veg stage but got very small flower. I checked that the light has many blue leds and less red leds. But as i know that red LEDs are good for flowering. More important is the bad quality, LEDs burned out after three months. So I just used the light for one round and then just can not use it. I think it just waste my time and money. 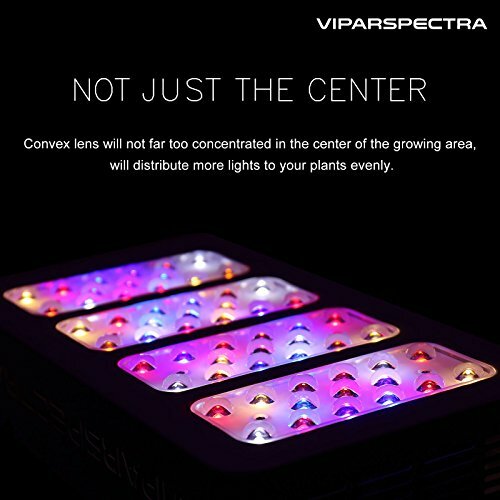 Viparspectra is a terrible brand for plants growing. 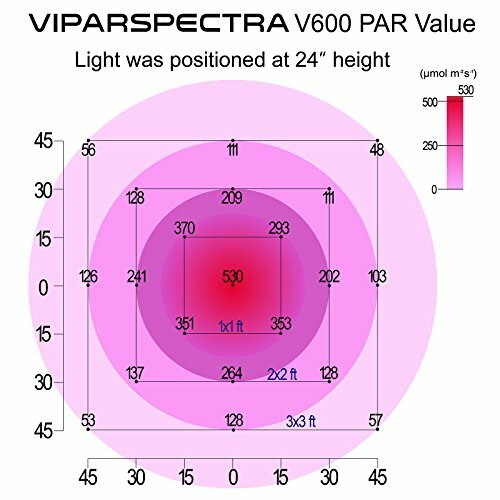 Viperspectra has a 300 watt model geared towards bloom spectrum. The R/300 . It is the same price as the V/300. I have each. Actually 4 of each. The R/300 has way more reds than blue. I lost the vegetative side of my 450 w light. It is less than a year old and maybe 300 hours. An easy solution or fix? I have been using the 1200 for flower and (2) two of the 450’s for veg. GREAT results ! ! Very satisfied ! ! 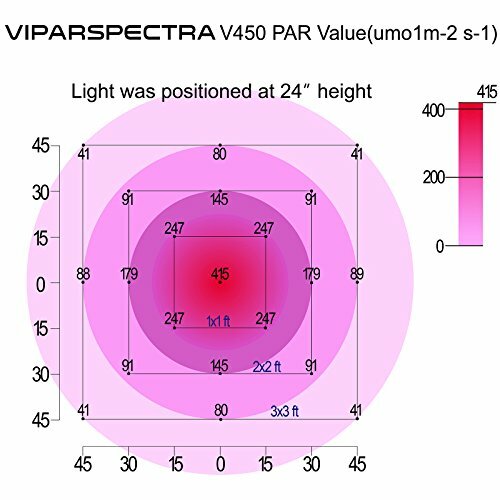 So with vipraspectra warranty, if lights go out they send replacement? I’d be very upset if this happened to me after buying 4 600w dimmable. Hello! I use 4x400w HPS on growbox of 200х200х200 cm in size. A method of cultivation SCROG will wanted to put LED lamps which will be equivalent to HPS lamps on 400 watts. What will you advise the Lord? With respect for the colleague! The previous message wasn’t correct. Now I have made normally. I prefer a full cycle in the earth and the Scrog method. Tell now once again please what better lamps and how many it will be necessary pieces on such size of an awning will approach as I have written to you earlier. Thanks, with respect for the colleague!